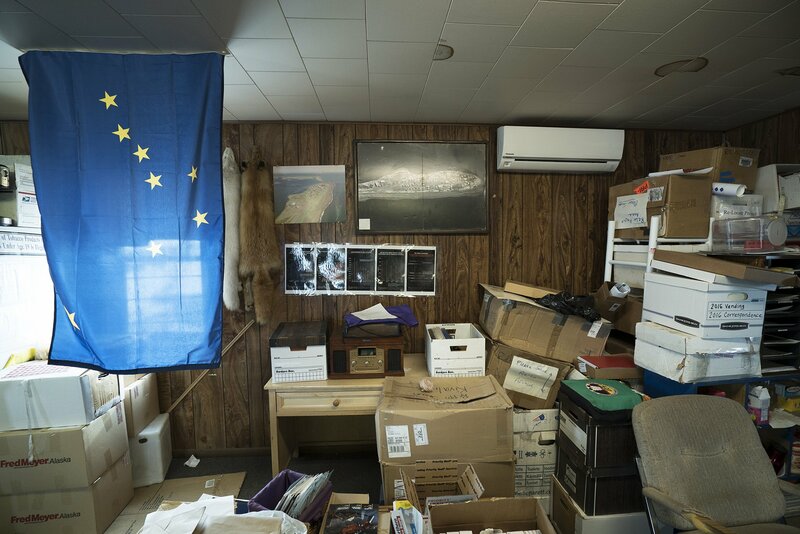 How a Tiny Alaska Town Is Leading the Way on Climate Change KIVALINA, Alaska — Dolly’s home is warm and spacious. Snow gear sits by the door. Illustrated Christianity posters are on the walls. A Mario game is being played on the TV. It could be any house in the throes of a Midwestern winter. Until, that is, Dolly serves maktaaq — small strips of frozen bowhead whale skin and blubber. Despite it being late at night, sunlight bounces off the walls. That’s because this is Kivalina, Alaska, some 70 miles above the Arctic Circle and 1,000 miles from Anchorage. Her husband Reppi, who’s a fireman, hunter, and whaling captain, puts a video on the TV. A snowmobile zips across the snowy ice. A wolf in the distance hears the motor and runs. A rifle is raised, a shot is fired, the wolf staggers, the snowmobile speeds ahead, another shot is fired, and the wolf falls. That wolf’s hide is slung over a water tank in front of us. Caribou has recently been killed, too, meat which has been fried, roasted, put into soups. This is part of the tundra subsistence that the people of Kivalina have practiced for centuries. In the weeks ahead, Reppi will have a different hunting target: bowhead whale. When a whale is caught in Kivalina, everyone rejoices. The whaling captain is celebrated, the elders distribute the meat down to the last morsel, stories of heroism are shared, and people celebrate for days. Catching a whale can feed the community for months and it forecasts good times to come. But whether Reppi or anyone else in Kivalina can catch one is uncertain — a bowhead hasn’t been caught for more than 20 years. 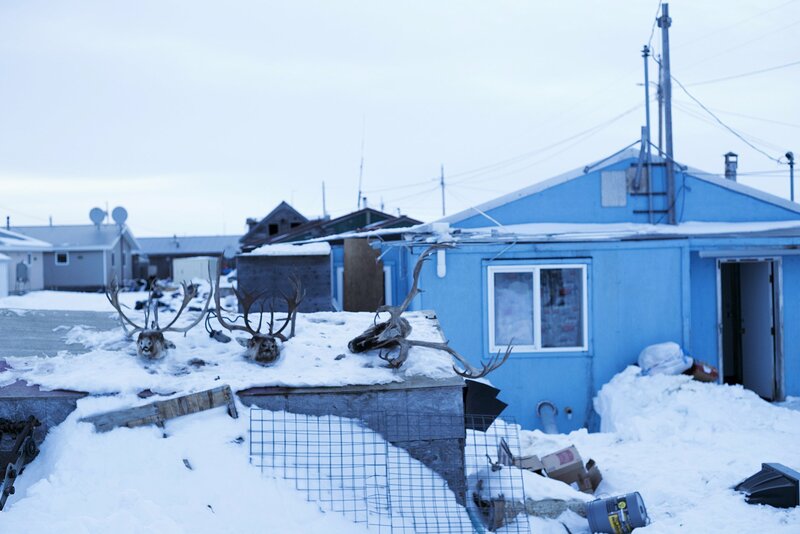 In this small community of around 450 indigenous people in Northwest Alaska, just about everything is uncertain. 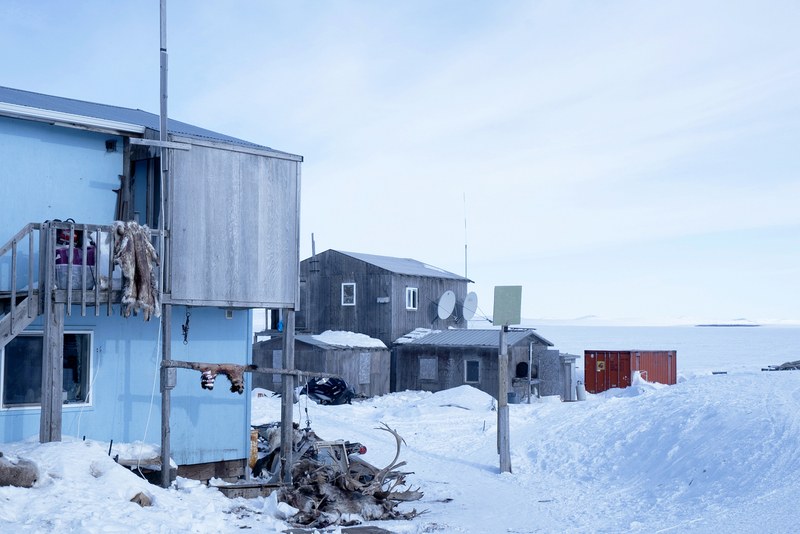 Few places in the world have been as rocked by climate change as Kivalina. Temperature increases in Alaska double the US average, Arctic sea ice has dissipated by 50% since 1979, and the state’s glaciers are losing 75 billion tons of ice a year. The consequences are both sudden and gradual for the people here — powerful storms are sweeping away the community’s coastline and centuries-old cultural practices like whaling are endangered. Kivalina is experiencing now what millions of people around the world are soon to face — they are climate change refugees. Within 10 years, the Army Corps of Engineers has said that the barrier island will no longer be a viable place to live — the inhabitants will be forced to move. By 2100, as many as 13 million people living in coastal regions of the US and hundreds of millions more people throughout the world could be displaced by climate change. 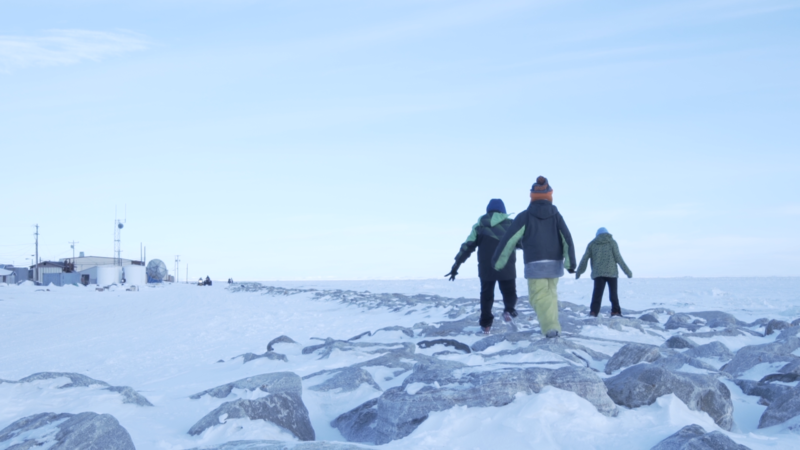 Against this daunting backdrop, citizens of Kivalina are emerging as unlikely pioneers, navigating a thicket of logistical challenges to champion their own relocation. Cities and towns in similar positions have garnered headlines for deciding they must move because of climate change. And now the people of Kivalina are showing us what happens next. If they succeed, then perhaps the term relocation, which for so many indigenous people evokes the trauma of colonialism, can be reclaimed and dignified. Perhaps the uncertain future of climate change can be managed. And perhaps the mass turmoil looming over various parts of the world can be averted. All around the world, the pressures of climate change are exposing a frightening lack of preparation and political will. Nowhere is this lack of readiness more pronounced than in the field of relocation. “Even in the short term, in an emergency, we have no idea what we’re doing, and it’s even tougher to think of a gradual displacement,” said Irwin Redlener, a child health and disaster response expert at Columbia University’s Earth Institute. In Alaska, relocation is, at least in theory, much more straightforward than it would be for a metropolis like New York or Miami. 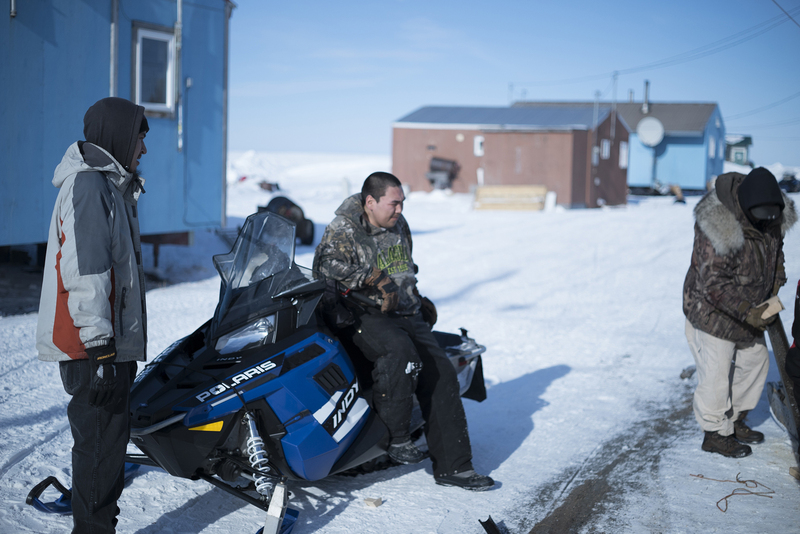 Kivalina has a small population and the state has plenty of land to resettle them. Other places around the world do not, but whereas the US is delaying action, many other goverments are taking the threat of climate change seriously. The Maldives, a small string of Pacific islands, is building new islands for people to relocate to when existing islands get submerged at tremendous expense. In Palau, another small Pacific island, the government created the largest marine reserve in the world to serve two purposes: create a large buffer against waves and attract global investment for inevitable relocation. Leonardo DiCaprio is an investor. 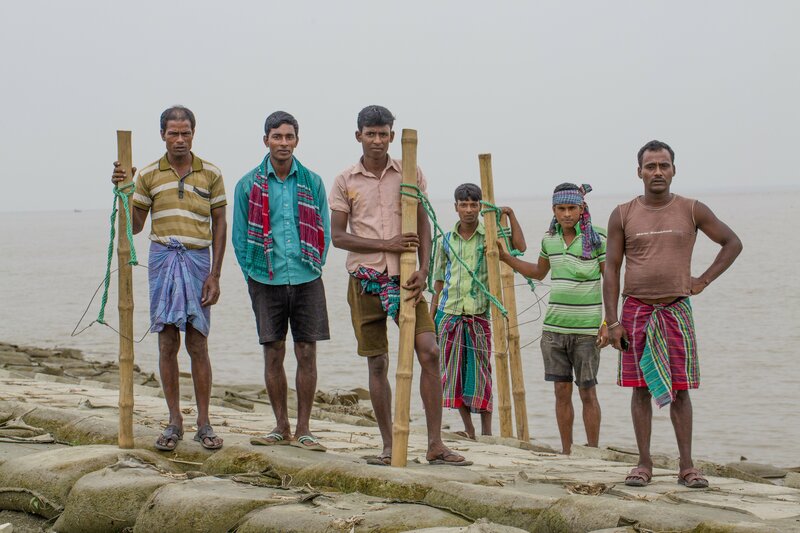 In coastal Bangladesh, rising sea levels, landslides, erosion, and cyclones are causing saltwater to seep into rivers, ruining vast sections of rice fields and rendering water undrinkable. In Mexico City, the ground is sinking as the city’s aquifers get depleted from overuse, drought, overdevelopment, and warming temperatures. 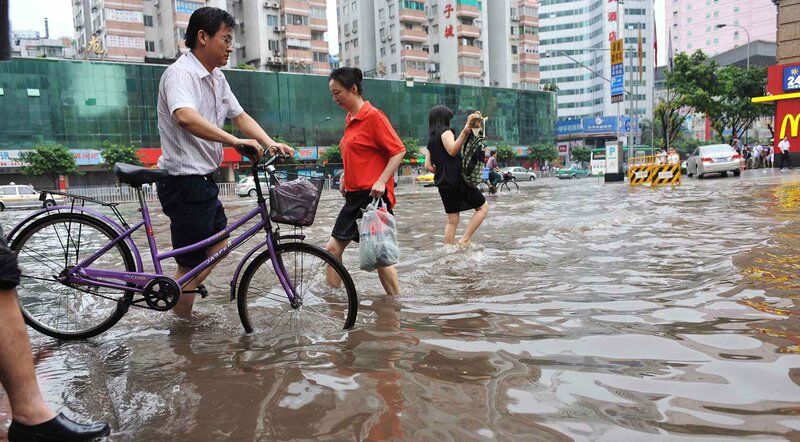 The city of Guangzhou, a multi-trillion dollar powerhouse in China, is being inundated by rising waters and extreme precipitation. In 2016, the city experienced the most rainfall in history and the sewage systems of the poorer and more crowded neighborhoods are already becoming wrecked. This growing awareness has spurred international groups to think about adaptation more holistically, especially regarding communities most at risk. The World Bank has disbursed $358 million in climate adaptation grants, Switzerland and Norway created the Nansen Initiative to begin the process of developing a better framework for adaptation, the UN’s Green Climate Fund has disbursed more than $1.5 billion for environmental programs, and the Paris climate accords created systems to help low-lying countries and indigenous communities adapt. But the mere inclusion is pivotal and could represent a change in thinking. Hano’s report looks at 27 examples of managed retreat covering 1.3 million people in 22 countries. It considers the full spectrum of why a community might want to leave and what role they play in shaping their future. The US government, for instance, purchased 36,000 homes at high risk of flooding through the Hazard Mitigation Grant Program between 1993 and 2011. These properties were converted into open land to shield against future floods. The program had been limited to the most high-risk properties and wasn’t really concerned with what happened after people left their homes. 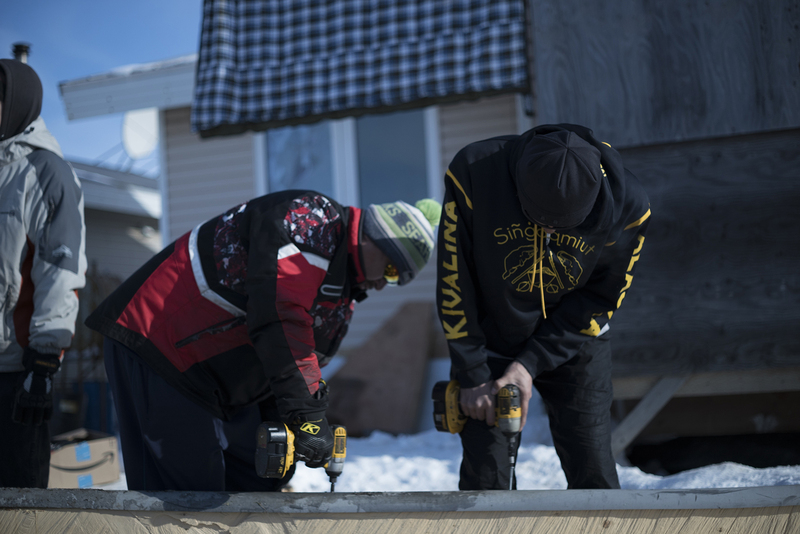 In Kivalina, what happens after people leave their homes is what their mission is all about. Even in Kivalina, where the stakes are so clear, the state has failed to act. In 2003, state, federal, and village governments identified 31 places in Alaska that face “imminent threats” from climate change. Of these sites, 12 have voted to relocate and three have been deemed in urgent danger — Newtok, Shishmaref, and Kivalina. Yet none of them have successfully relocated. The lack of action is not necessarily because agencies tasked with helping are failing to do their jobs. Rather, it’s often because they have not developed frameworks and protocols for effectively dealing with the situation. The Federal Emergency Management Agency (or FEMA) is meant to respond to disasters that overwhelm state and local governments — like Hurricane Katrina or Superstorm Sandy. 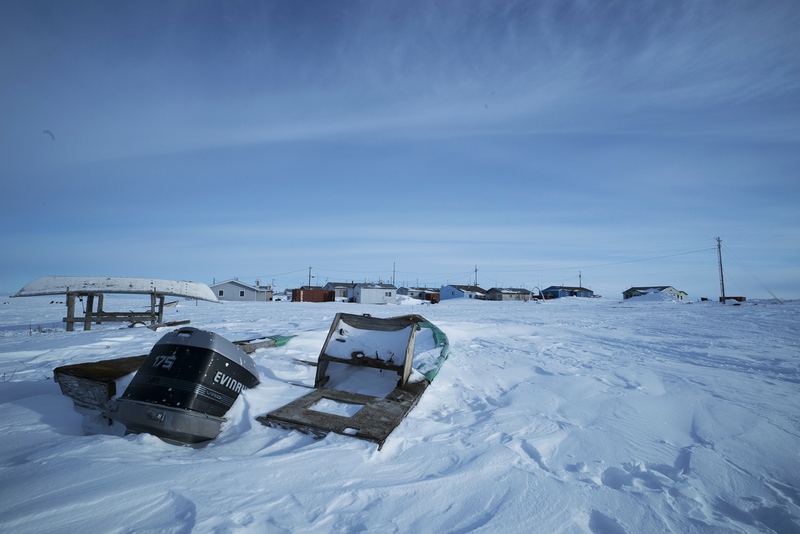 Kivalina, while it will be uninhabitable in eight years, hasn’t been declared a federal disaster area and cannot access funds made available through this designation. FEMA has begun to reconceive its approach to climate change, but those efforts remain unfinished. The Department of Housing and Urban Development (HUD) has also begun to adapt to climate change through a climate resilience program that disbursed $1 billion dollars in 2015 to municipalities around the US. Among the recipients was a small island off the coast of New Orleans called the Isle de Jean Charles that received $48 million to relocate. The community there developed a comprehensive relocation strategy that resembles the work done by Alaskan communities like Kivalina. 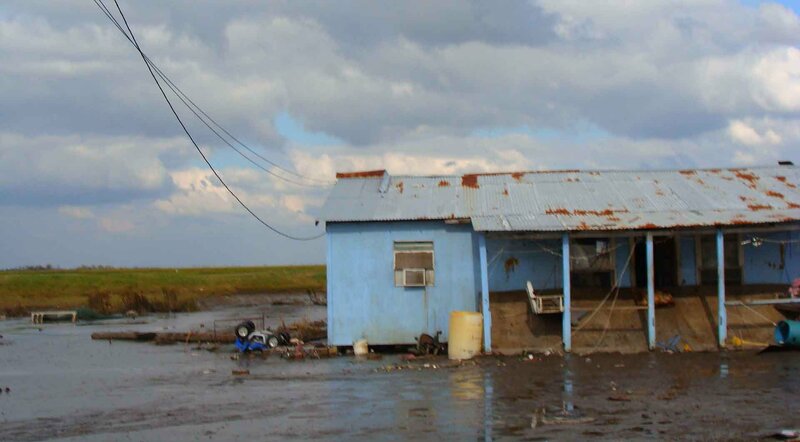 Since 1955, the Isle de Jean Charles has lost 98% of its land due to saltwater intrusion, subsidence, and sea level rise. But that fund has not been replenished — and under the new administration, it seems unlikely that it will be prioritized. Further, Native Americans in Alaska do not live on reservations. They live on what are known as “Alaska Native Corporations,” and this unusual designation blocks them from applying for many HUD grants. 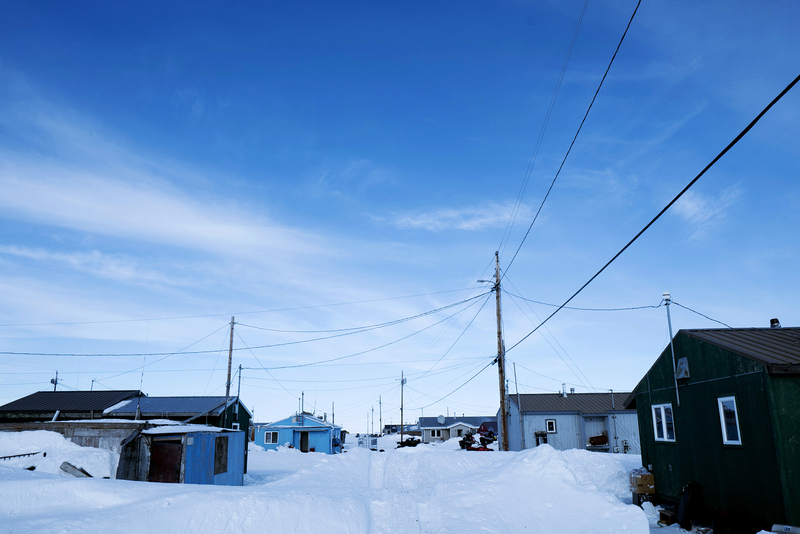 Kivalina happens to live on city-owned land, but surrounding territory is owned by NANA, the regional corporation. The US Department of the Interior, meanwhile, allocated $6.5 million last year to help Alaskan indigenous communities relocate. But that doesn’t even scratch the surface of the financial demands, which are estimated to be around $200 million in Kivalina alone. 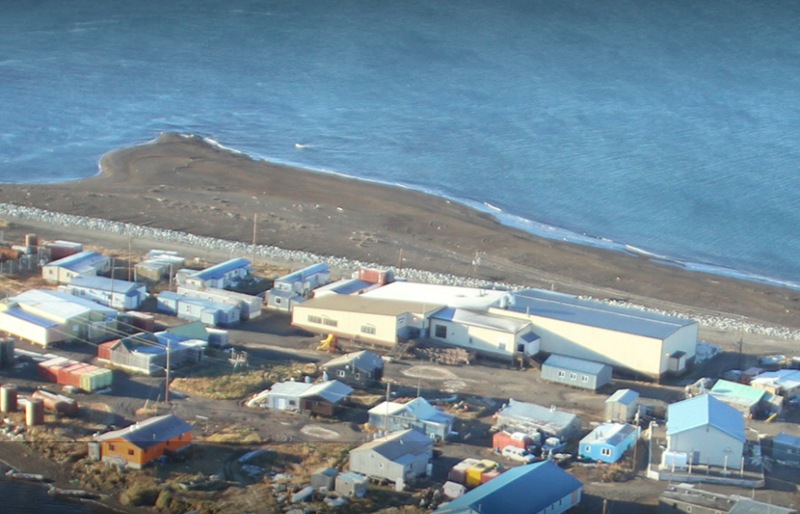 Obama toured Alaska the same year of the Isle de Jean Charles grant and called for $400 million additional funding to help communities like Kivalina adapt and relocate. That funding never materialized and is unlikely to under President Trump. In Alaska, the undeniable effects of climate change means that politicians generally accept it’s happening, but not much action has taken place. Previously, remote communities in Alaska had to rely on support from the Denali Commission, an underfunded federal agency that’s devoted to helping communities in Alaska threatened by the environment. The commission is developing strategies for dealing with erosion, flooding and permafrost loss, but unless it receives a major boost in funding, it will have little impact. “Sen. Murkowski acknowledges the impacts of climate change on Alaska’s coastal communities and believes that the federal government should step up its relief role, but she does not want Alaska’s rural communities used merely as political talking points,” the senator’s spokesman Matthew Felling told The Washington Post. Sen. Lisa Murkowski has also put forward legislation to raise funds for adaptation and relocation efforts. Neither Sen. Murkowski nor Sen. Dan Sullivan returned requests for comment. Congressman Don Young believes that climate change is happening, but refrains from blaming human activity. The current governor, Bill Walker, also acknowledges the need to act on climate change, saying that adaptation funds need to be created. But no fundamental policy changes or adaptation efforts have been made at the state level that would really improve the plight of communities like Kivalina. The state’s ongoing efforts to placate climate change are riddled with conflicts of interest. 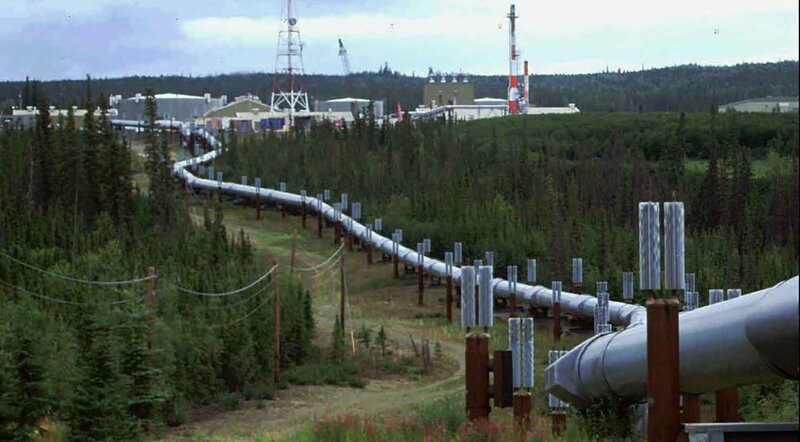 Since Alaska earns much of its revenue from the energy sector, the funds that Gov. Walker and Sen. Murkowski call for would be paid for by drilling for more fossil fuels — exactly what has brought Alaska to such a dire place to begin with. This same fundamental problem — sustaining a fossil fuel economy even as climate change intensifies — can be found all across the world. Alaska is essentially a big pot of oil. It has some of the largest and purest reserves in the world. For years, the state government, which does not tax citizens, received around 90% of its revenues from the oil industry, which funded everything from the school system to road repairs. Now falling oil prices are causing major budget cuts. In recent years, oil companies have sought to drill for oil in the Arctic waters. It’s a faustian bargain if there ever was one — a spill in this area would almost surely mean environmental disaster, yet the successful extraction of oil could secure financial security for years ahead. By the time Shell Oil abandoned its bid for Arctic oil, the central contradiction of Alaska’s dependence became more clear — the price tag of adapting to climate change will be astronomical for the state. Without oil money, it has little chance to cope with those costs. But allowing the oil to flow just makes the problem worse. 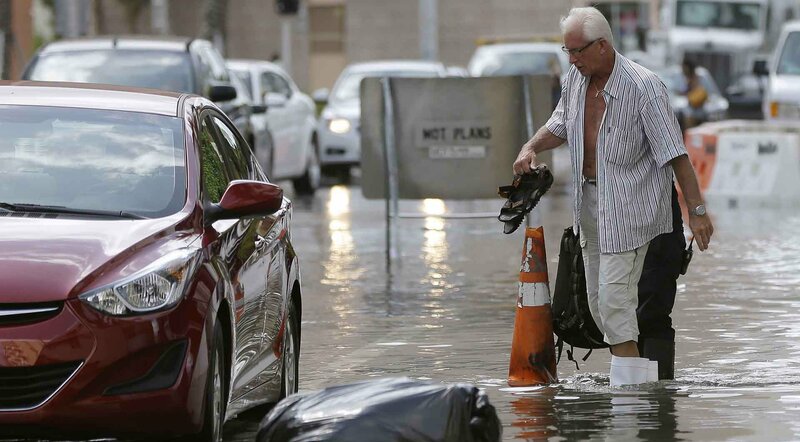 On almost the opposite end of the US from Kivalina, the streets of Miami are also filling up with water. Unlike Kivalina, however, the city and region have huge tax bases to draw on. As funding from the state and federal government remains elusive, this is buying the city some time. The city, and the broader Miami-Dade county in general, has another thing working in its favor — there’s broad bipartisan support for action. It’s what happens when climate change goes from being an abstract, planetary event to something that leaves your car stranded in the middle of a flooded street, or winds up depositing an octopus in your basement. Climate change is not as politicized in Alaska, either. But until other politicians become as proactive as Cason, advocates, including those within Kivalina, are calling for new approaches. “The pattern today has been to wait until after the disaster occurs or displacement occurs to think about the need to move people so usually governments are unwilling to be proactive because this is such an incredibly sensitive issue,” said Alice Thomas from Refugees International. This wait-and-see approach is both dangerous and expensive. Failing to adequately prepare for climate change puts people at risk of injury, disease, and death and leaves infrastructure open to costly damage. “With Hurricane Katrina [in New Orleans], the levees failed and we got tremendous flooding, but the community before that knew there were plenty of problems happening already,” said Irwin Redlener of Columbia’s Earth Institute. Every so often, news reports tell of a random sinkhole opening up, swallowing a sidewalk, a car, and even homes. Alaska faces a similar risk — more than 80% of it sits on permafrost, which is essentially frozen ground that's been melting in recent years. 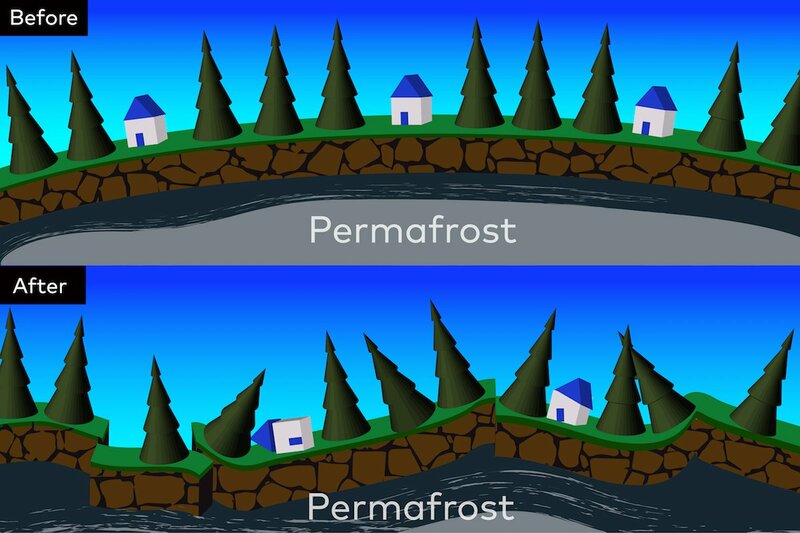 Sometimes permafrost is spread evenly across an area, other times it’s jagged. Infrastructure that sits on uneven layers of permafrost sinks unevenly into the Earth as temperatures rise, causing building foundations, sewage systems, and more to falter and decay. Part of what has stalled the expansion effort for Kivalina is melting permafrost on potential relocation sites. “Most of the regions with permafrost are really close to the tipping point,” said Scott Rupp, deputy director of the International Arctic Research Center. This is one problem facing Alaska. But for Kivalina, there are threats above and beyond the subterranean. The biggest threat comes from the Chukchi Sea, a body of water that runs to Russia, harboring within it the force of hurricanes. In the fall, the sea usually freezes and protects Kivalina from harsh seasonal storms. But in the last 20 years, the sea has been freezing later than usual, leaving the village dangerously exposed to harsh fall storms. In October 2015, the average temperature in was Alaska 37.5 degrees Fahrenheit, five degrees above the norm. This temperature spike has been happening for decades and has caused nearly 50% of Arctic sea ice to vanish. Now storms batter the island, swallowing chunks of land, and causing the shore to erode year after year. “Back in 2004, when everyone first discovered erosion and global warming here, one of the houses at the far end of the island had to be moved because it was hanging half into the ocean, all from erosion,” said Alexis Hawley, a young mother and youth advocate. This was the turning point for Kivalina, the year that frighteningly illustrated what’s to come. In the past, the sea ice of the Chukchi sea, west of Kivalina, would be frozen solid by October. In the October of 2004, the ice had yet to form and the water’s tide lapped menacingly in the distance. That’s when the waves came ripping across the exposed sea and crashed into the island’s beach, flooding pathways and homes with water, and pulling away large chunks of land. That year, storms eroded 70 feet from the beach and put the school in imminent danger. Temporary sea walls of sandbags and other materials were built over the next several years, but they all failed, sometimes in less than a month. 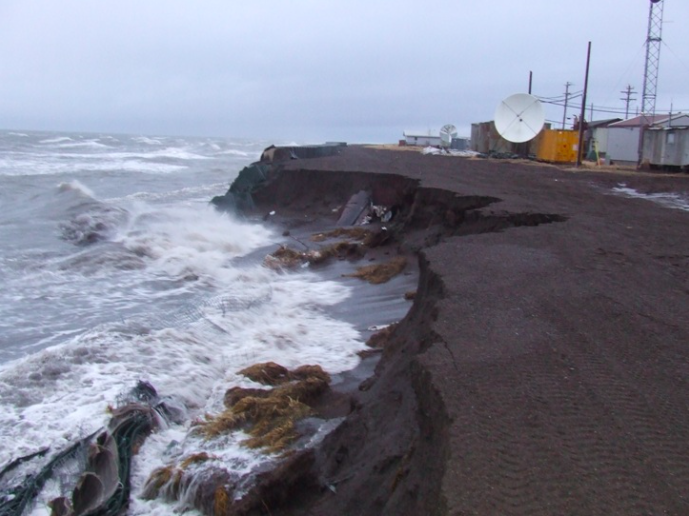 Then in 2007 when another brutal storm trampled the island, causing more than half of Kivalina’s residents to evacuate, the Army Corps of Engineers began a new assessment that resulted in a sea wall of large boulders that cost several million dollars. The Army Corps also put the federal and state government on notice — Kivalina would be uninhabitable by 2025. The people of Kivalina are tired of the word “relocation.” They’ve been working on this goal for so long that the word causes fatigue, evoking years of stalled or stifled efforts. Kivalina has a long history of working through the intricacies of government and developing a framework for self-reliance — knowledge and wisdom that could prove indispensable to communities all around the world. They first clamored to move more than a century ago when they were forcibly settled here by the federal government. Up to the 1990s, overcrowdedness was the main motivation. Then in 1992, relocation gained a new dimension: climate change. In the early 2000s, the fragility of their land became more clear, and the Army Corps reported that the island was at severe risk. Since then, the community has fought for relocation, eventually with the help of Re-Locate, and they hope to expand from the island as soon as possible — 2025 is the absolute deadline. A nearby site for relocation had been selected in 2002, and action plans for how to carry relocation were developed. Since the mid-2000s, however, progress has stalled. Recently, technological, social, and infrastructural innovations have been made that could have impacts around the world. Take water and sanitation. More than 780 million people around the world do not have access to adequate water and and 2.4 billion do not have access to toilets. Climate change displacement could drive these numbers up. Over the past few years, Kivalina has begun investing in mobile toilets, urinals, water tanks, and waste processing machines that are entirely self-sufficient, easy to move, and sanitary through a partnership with the Alaska Native Tribal Health Consortium and the Cold Climate Housing Research Center and other groups such as Re-locate, a collective that has been helping Kivalina for the last five years. Re-Locate participates with Kivalina in the State of Alaska Water and Sewer Challenge and partnered with the City and Tribal Council to build the Kivalina Biochar Reactor, the Arctic’s first relocatable human waste sanitation system. This mobile system costs a fraction of what a full-fledged waste system would cost and will potentially save the community tens of millions of dollars. Then there’s the difficult task of community outreach and cultural preservation. 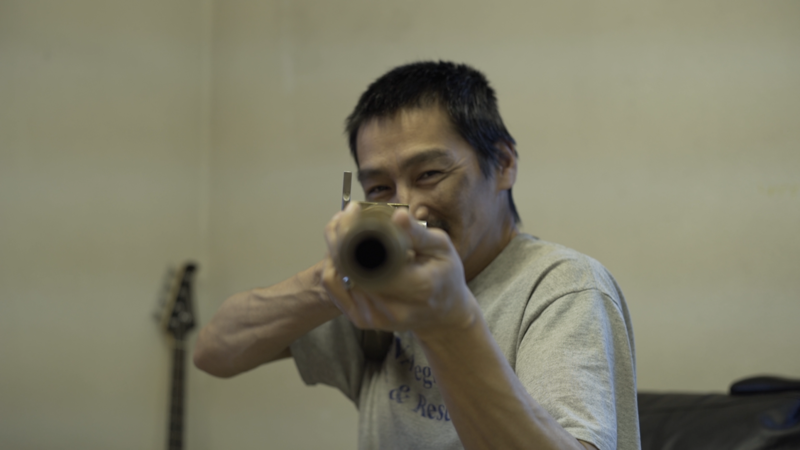 The people of Kivalina are deeply attached to the land and sea — hunting and gathering have sustained the Inupiat people for countless generations. Right now, youth leaders like Alexis are cataloguing and teaching traditional methods of subsistence through a Food Sovereignty Project. The people of Kivalina harvest the land abundantly through hunting and gathering and the more food independence Kivalina can achieve, the more viable its future becomes. You can walk the span of Kivalina in 20 minutes, crossing over lanes carved by snowmobiles because there are no cars, receiving friendly waves from everyone. You’ll pass kids in winter gear playing baseball or riding bikes, freshly flayed animal pelts, arches made from bowhead whale bones, half-buried row boats, all sorts of snowmobiles, and dilapidated homes with wind-worn facades. There are two large cylinders in the center of town, one holds filtered water, the other raw water. People can get water from the filtered tank for a dollar, but nobody drinks this water because of potential contamination. It’s only used for washing, doing dishes, and cleaning. Kivalina residents working on snow machines. (Hans Glick/Global Citizen). Town of Kivalina. (Hans Glick/Global Citizen). Drinking water is harder to come by. The faucets don’t work — there’s only running water in the school, a community center with showers, and a rudimentary health clinic. Most homes have reverse osmosis filtration machines, large plastic chambers that sift out contaminants, but the grocery store is the safest bet for clean water. There, a case of six gallons of water is around $45 and smaller water bottles go for several dollars. All the store’s wares are flown in on 10-seater planes, making prices prohibitively expensive in a town where few people earn a steady income. In fact, the daily 10-seater plane is the only way to get to Kivalina. The lack of routes in and out contributes to a sense of claustrophobia in this snow globe at the tip of the world, cradled by tradition and rocked by the future. The tightness is felt more sharply inside homes, where three or four families crowd into a few bedrooms, spread across generations. For young adults — unable to secure a home for their families because there is simply no place to build, no place to go — there’s a constant feeling of a future deferred. More than a quarter of the island lives below the poverty line and jobs are hard to come by. Most homes use “honey buckets” as a toilet — they’re containers with plastic bags that have to be emptied multiple times a day at a sewage lagoon far beyond the village, past the air strip. Families that don’t have a way to travel that far sometimes let the bags pile up outside their homes. In the summer months, the smell can be strong. Occasionally the landfill floods and pollution seeps into fisheries. Strep throat, pneumonia, stomach bugs, and skin infections spread swiftly throughout the island. Kids running around have coughs and face rashes. There’s no full-time doctor or dentist and if someone gets very sick or injured, they have to get airlifted to the nearest city. And now climate change is beginning to color all of these problems. 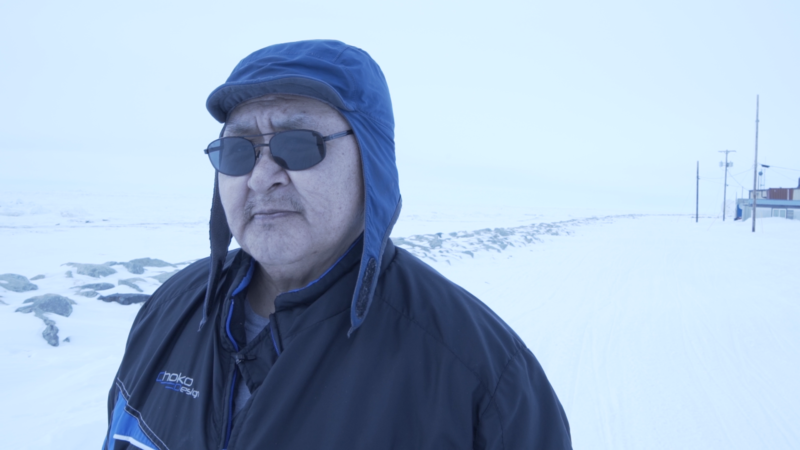 “You can talk to anyone here, maybe even the children, they’re able to talk to you about climate change,” Enoch Adams Jr., a whaling captain and Episcopal preacher, told me. The changes are happening too fast for people not to notice: Rain in December, massive flooding, brutal storms crashing against the shore, early ice and permafrost melt. The animals are another indicator. There are birds roosting in the area that had never been spotted before. Skates — creatures that look like stingrays — have recently been seen in waters that had once been too cold. Seals, in particular, are acting strangely — sometimes they’ll be sitting on a beach deliriously swatting at the air, oblivious to your approach. Other times, they’ll have skin lesions that show as their fur falls off. All the primary animals that they hunt — ducks, caribou, seals, tom-cod, salmon, arctic char, and more — have been affected in one way or another by climate change. And then there are the whales. People hear them each year, moans booming under and across the ice. They’re tantalizingly within grasp — bowheads are coming closer to the shore each year to evade the Orcas, which have recently expanded their range because of warming waters. But nobody can get to them because the ice is so thin. Relocation is also within grasp, but it has come to feel like a mirage for many people. And much as the failure to catch whales deepens collective anxiety of cultural loss, the failure to relocate deepens existing community problems. Each year, the town gets more crowded. Young adults, feeling cramped by a lack of opportunity and the tightness of the island, often despair. While data is unavailable, I was told by community members that depression and suicide rates are high, and that three young people had killed themselves the year before. It’s with good reason that some in the town are losing hope. While the state has set aside funds to support them, a litany of red tape and Catch-22s prevents progress. The school is too small, but the state’s School Construction Grant Fund won’t use the $43 million allocated for a new building until relocation happens. But relocation can’t happen until the new site has key infrastructure, like a school. The community needs better access to water and sanitation, but the state won’t build a sewage system until enough people are living on the relocation site. But people can’t move until the relocation site has basic things like some sort of sewage system. The longer that relocation is delayed, the more life on the island becomes harder. “They’re trying to navigate all these things simultaneously,” he said. Politics at all levels is complicated — there are competing interests, different factions, budgets and realities to contend with, constituents to please, outside groups to court, coalitions to form, and expectations to manage. Kivalina is no different. Except while local politics elsewhere is generally concerned with mundane matters — where to put a street sign, what a park should look like — in Kivalina, the stakes are drastically higher. The community is navigating the unprecedented: a coordinated retreat from climate change. Relocation planning in Kivalina involves a complex matrix of local decision makers. And while everyone agrees that relocation must happen, coordinating the move with local, state, and federal governments has been challenging. To do that, they’ve been embarking on an effort of radical transparency to make a village- and worldwide understanding of the issues and plans possible. Years of material relating to Kivalina’s relocation — meetings, ideas, achievements — are being uploaded onto a digital archive. Every item will be available to Kivalina people and select items will be made public by its owners to be studied around the world. Although environmental forces are rendering the barrier island uninhabitable, the community is taking charge of the relocation process. When I visited Kivalina in early April, I attended a meeting of relocation leaders who have spent decades working through complex bureaucracies, mastering the systems and dynamics of state and federal government. They’ve petitioned time and again for logistical and financial support, filed lawsuits, held rallies, and brokered with the biggest regulators in the country. 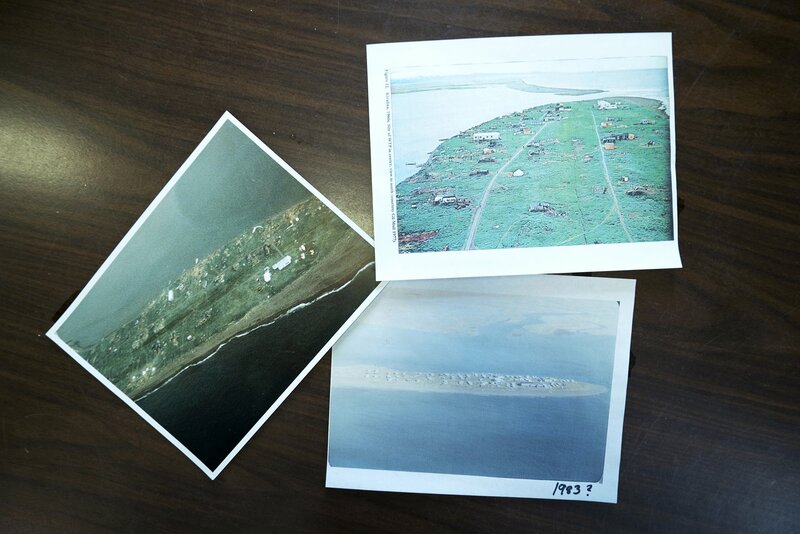 Aerial photographs of Kivalina from decades ago were on the walls, showing how the the island’s coast has receded over the years. Part of this engagement stems from not wanting to repeat the traumas of the past — when their ancestors were forced to settle on the island in the first place. The people of Kivalina refuse to be seen as victims or bystanders, and they refuse to let community interests be ignored. They have a deep commitment to each other, their culture, and the environment. "I am cashless, I have no income, but spiritually, mentally, I am not poor." They’re also driven by a sense of global responsibility. All across the world, climate displacement is happening — sometimes violently, sometimes slowly, sometimes with no institutional support at all. Indigenous communities around the world fought to get the Paris climate accord to include the goal of keeping global temperature increases under 1.5 degrees celsius rather than 2 degrees celsius, an enormous difference. Kivalina sees itself as part of this narrative. 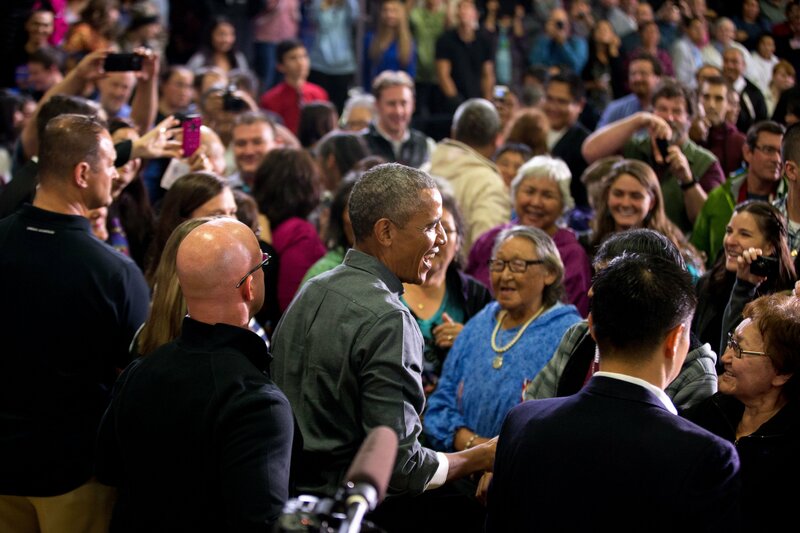 In 2015 when President Barack Obama toured Alaska to see the effects of climate change on indigenous communities, it was Kivalina’s tribal council president Millie Hawley who introduced him at an event in the regional city Kotzebue. Obama wasn’t able to visit Kivalina because the air strip is too small to fit Air Force One, but he flew over the island and observed its extreme fragility. In Kivalina, the vulnerabilities can no longer be papered over and everyone in the village knows this. But despite the sense that they’re being strung along, that each delay is a wasted opportunity, the community is still striving for a better future. 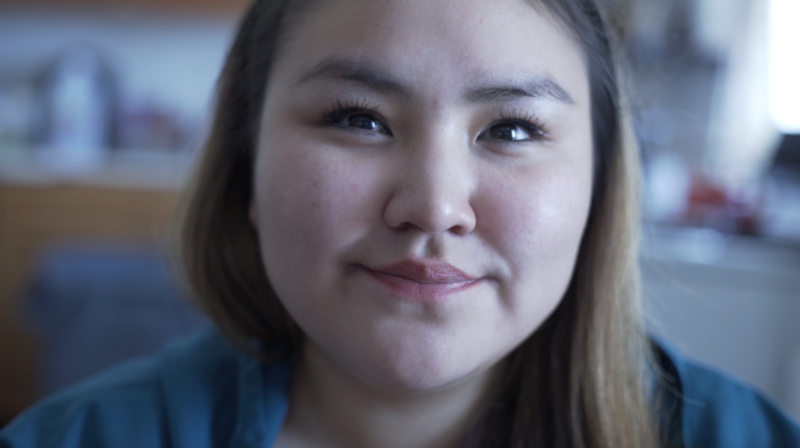 Alexis is leaving Alaska for the first time in May to attend a conference of indigenous youth advocates in Washington. Colleen is eager to build global coalitions. Enoch thinks it’s a great time to be alive. Dolly and Reppi are preparing for a journey far onto the ice to catch a bowhead. This is the year, everyone believes. This is the time to break the streak. In Alaskan whaling communities, catching a bowhead has powerful ripple effects — it’s believed to be a deeply spiritual being that spreads good luck and prosperity throughout a community. Around the island, there are coolers filled with provisions. Camping and hunting supplies have been gathered. All the snowmobiles, damaged from the harsh conditions of the past few months, have been repaired. Reppi’s crew is almost ready to go. The right day just has to present itself. And the ice — which might be too thin, have perilous snow-covered holes, or break and drift toward Russia — has to hold.